Now and until the end of April 2019, you can get a slice of cake or a cookie of choice and a hot drink (coffee, cappuccino, espresso, or tea) for 1 euro at the La Place restaurants in the Netherlands. A piece of cake alone is normally 3 euro, so it is a complete bargain. It is the price I used to pay at the HEMA store for the "4-uurtje" (hot drink and square cake set), but the quality of the drinks and cakes is better at La Place. I think it is a way to attract more customers to the La Place restaurants (new menu and cheaper options were recently introduced like the fresh bread with homemade herb butter on the side for €1.50) and to the Hudson's Bay department stores too, since many La Place restaurants are located at the top floor of the Hudson's Bay department stores. Compared to before, the La Place restaurant in the Hudson's Bay department store in Rotterdam city centre has become significantly more crowded, even during weekdays. I have went there many times already to give my legs a rest after a long day of shopping and to enjoy a nice afternoon tea (and sometimes, a coffee). 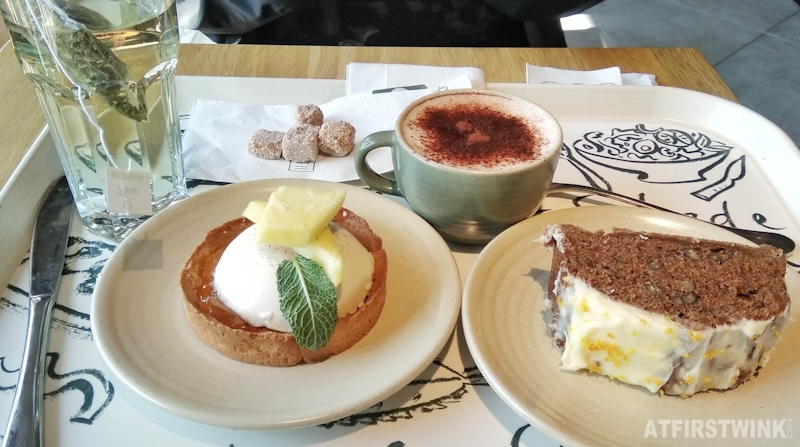 What we ordered: a glass of green tea, a cup of cappuccino, a pineapple mango panna cotta tart, and a slice of carrot cake with lemon cream frosting. 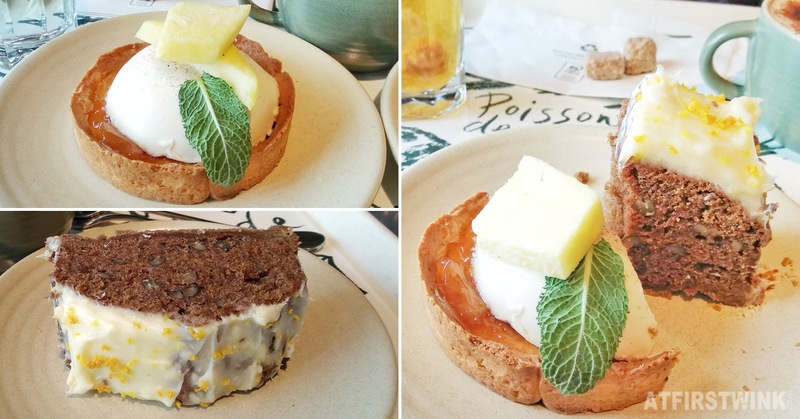 The pineapple mango panna cotta tart has a hard and crunchy, buttery, almond flour sand cookie crust, a layer of pineapple jam, a dome shaped panna cotta, a leaf of mint, and pieces of sour, unripe pineapple and mango. It was quite tasty! The carrot cake was soft and airy and not too sticky. I like that it wasn't too sweet or too heavy on herbs. The lemon frosting was also more on the sour side than only sugary sweet. I really like the normal green tea (not the green tea mint) with lots of brown sugar, but the cappuccino is also nice. The coffee flavor has a good amount of bitterness, but the cream and cocoa powder - that you can add yourself at the cutlery section - just doesn't seem to blend well and stays behind at the bottom of the cup, after you finish it. 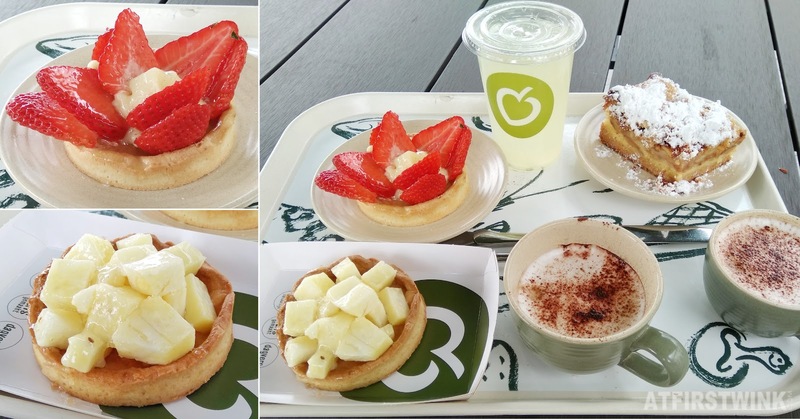 What we ordered: two cups of cappuccino and an apple crumble cake and a strawberry tart (1 euro per set). The homemade lemonade and pineapple tart were not for 1 euro. The homemade lemonade was not cold enough and very sour. It could use some ice cubes and a few spoons of sugar. The pineapple tart had a small dot of vanilla cream in the center and the pieces of crunchy pineapple were a bit sour. The apple crumble cake was nicely flavored with a hint of cinnamon and it was quite a large piece too. 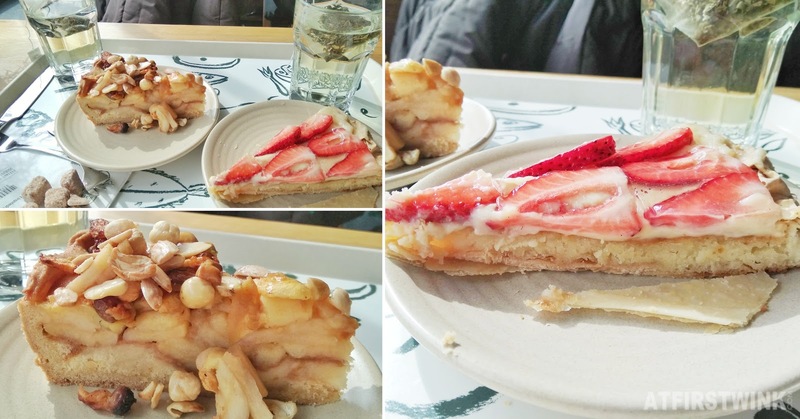 The strawberry tart from La Place is one of my favorites and the large pieces of strawberries were sweet and juicy. What we ordered: two glasses of green tea, strawberry almond cake, and apple nuts pie. The strawberry almond cake has a filo pastry crust, an almond paste filling, and topped with vanilla cream and fresh strawberries. It wasn't as crunchy as I imagined, but the flavors were great. The apple nuts pie was topped with plenty of crunchy and different kinds of nuts, but the apple filling was a bit bland (Did they forget to season it?). 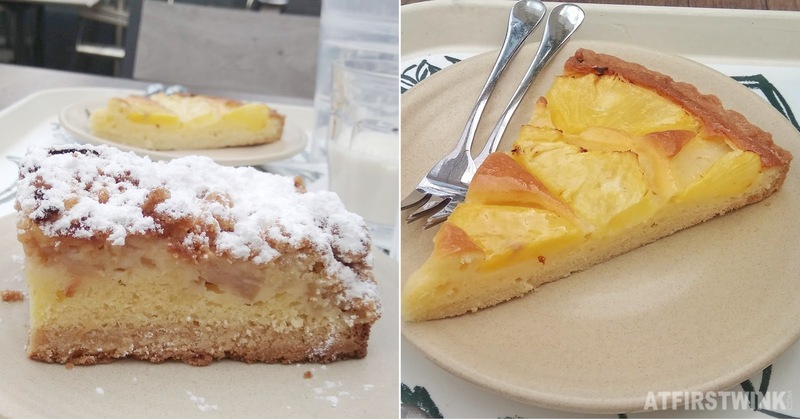 What we ordered: two glasses of green tea, apple crumble cake, and pineapple pie. The pineapple pie is something new and it is surprisingly quite tasty. The pineapple isn't too dry and the fruit flavor is infused to the rest of the pie (a thin layer of firm custard and a buttery crust). 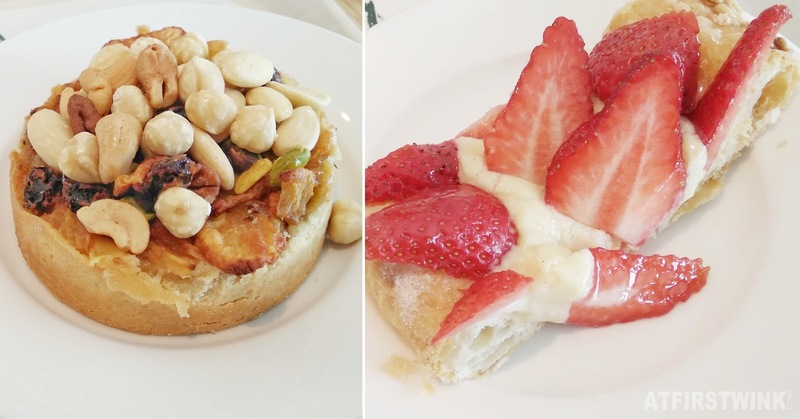 What we ordered: two glasses of green tea, apple nuts tart, and a strawberry pastry strip. The apple nuts tart is similar to the apple nuts pie that we ordered before. The apple pieces were this time well seasoned with cinnamon and sugar. The strawberry pastry strip has many fresh and sweet strawberries, a layer of vanilla cream, and a crispy layer of pastry dough on the bottom.